Today I feature myself...since I haven't featured myself yet - and don't often talk about my shop here. Not sure why that is. 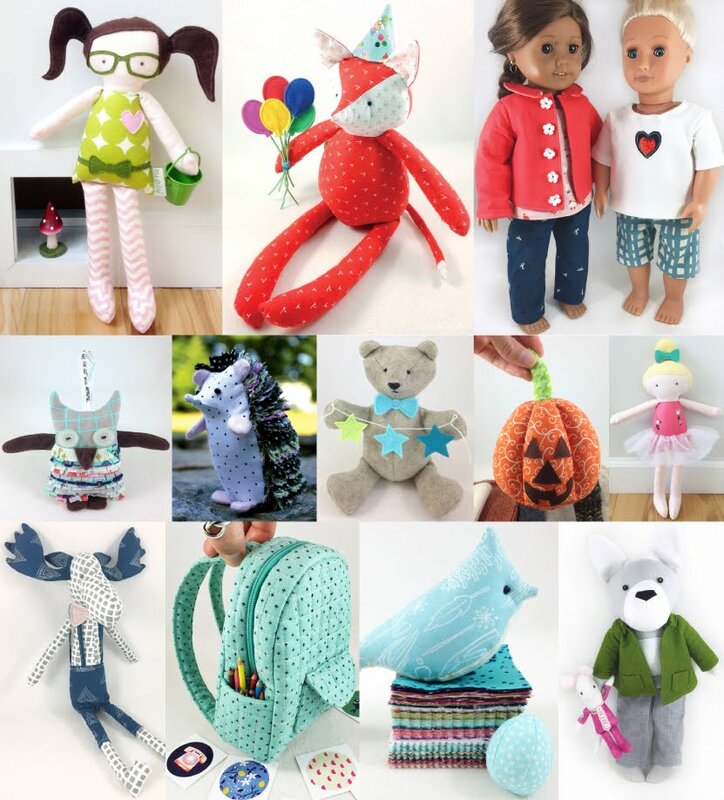 The shop (happycreations4u)/artist (Phoeobe) I wanted to featured today will be featured next week because she lost power in our recent East Coast storm! 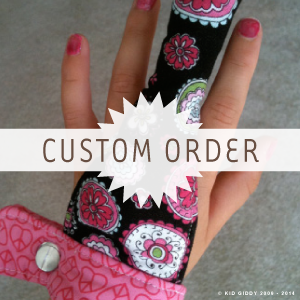 I never posted my Giddy-Up Friday yesterday because I was slammed with making my most popular item - my Thumb Covers. So I'll tell you a little about me and my shop today...and get back to our regular schedule again on Monday!!! 1. If you were a crayon, what color would you be? I would be White. With my mom being the art teacher that she is, I was always told White is actually not a "color" but a tint. (And likewise, Black is not a color either, but is a "shade"). Regardless, the world thinks white is a color, so I choose white. I love that white can lighten up other colors. I love helping people when they are in their struggles, and love to lighten their load. Many have done that for me, and it's a great feeling. 3. Which season do you love the most? Summer. I do love the changing seasons of Spring and Fall, but I really love to be warm. I love the sun on my cheeks and in my heart as it fills my soul for the cold days ahead. I love the color of green grass (but not the smell), I love hearing the birds singing, warm sand beneath my feet, and I love the blue in the sky! 4. What made you want to open up your Etsy shop? 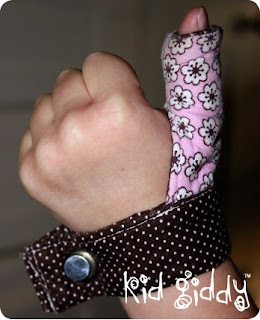 I wanted to help people get what they need (Thumb Covers to help stop Thumbsucking). I also wanted share my talents, and lighted the burden of my fabric spending on my families finances! I love the smell of fabric and it fills my craft room, I've got to use it up somehow! 5. What is your favorite item in your shop today? My all time favorite item is my Tuck 'n' Go. At first glance - people don't realize what it is, but it really works. I have a lot of friends I have given it to, and they have used it, loved it and passed it on to their family or friends! 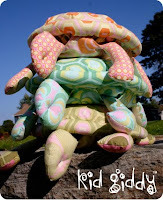 My next favorite is my Turtle Stuffy (I currently have 3 for sale in my shop)! The body can come out of it's shell and just looks so stinkin' cute! So that's me. 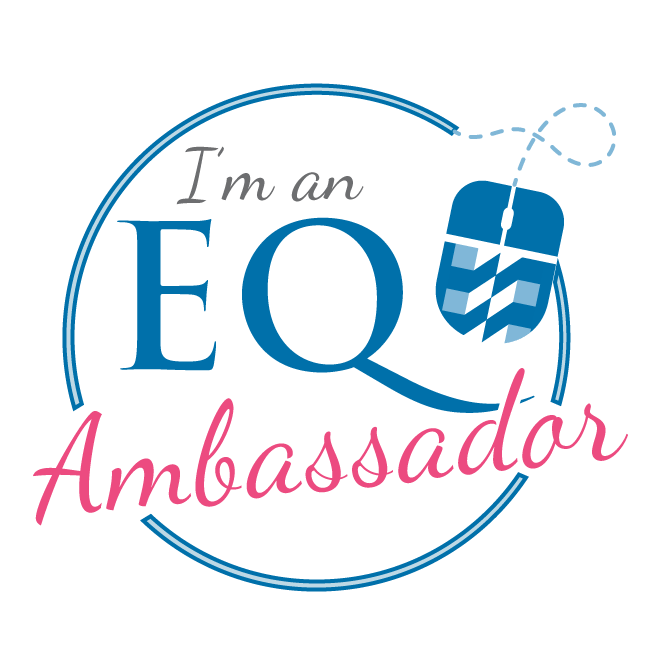 You can read more about me - on a different level by clicking the "About Me" tab above. Thanks for reading! Please remember all images are copyright and owned 2 is Beautiful, LLC. Please do not copy! Oh - so that's what it's called?! She cracks me up! So here it is. It's really time consuming - but worth it. Get out your crock pot. Get a whole bird. 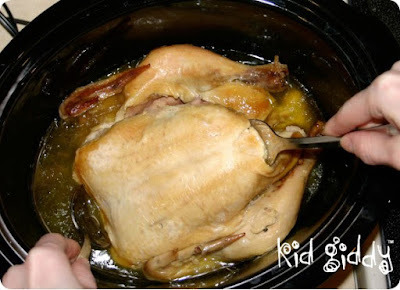 Rinse it - empty it out, and stick it in your crock pot. Speak kind words as you put the lid on top and crank it to high. (Low if it's in the morning - high around noon). And then walk away. That's it. You literally pop it in and walk away. How insanely easy. It is time consuming - but for the crock pot - not you!!! It will literally fall off the bones (which you do have to be very careful of! )...but I think that's why elephant loves it so much. It's tender, juicy and downright yummy! Again people - watch your portion control, it's easy to get lost in the finger licking good of it! 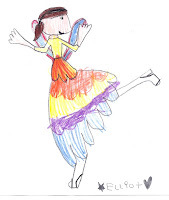 Since both of my girls were little, they had one thumb in their mouth as they used their other hand to draw. Monkey started drawing at the tender age of 13 months old. She always wanted to take our pens or pencils and do what we were doing. I bought her some washable crayons and discovered she was going to eat them down to the paper...so think quick - plan b. I ventured out to Target and found a large Magna Doodle board that became our saving grace...and hers. She drew everyday. Every minute - from sun up to sun down. And still does. Before she turned 2 she was drawing recognizable drawings of the Sesame Street Characters, that I began teaching her after she could draw circles and ovals. She's won tickets when she was 3 1/2 years old to see Sesame Street Live for coloring in a really good picture of the characters, and then drew on the entry envelope a picture of Annie her dog Sandie and herself. The girl Rachel that called with the good news of her winning was in shock with the drawings on the envelope and said that was what sealed the deal for her as the winner. 2 years ago she drew a picture of a dairy farm and entered it into the calendar contest at Daddy's work, and made it in there as August. She to this day, carries her own. She drew Daddy with his spiky hair before she turned 2 years old, and is now drawing princesses and castles galore. She is just as advanced as her sister and looks forward to winning her own contest someday. So for today's Busy Monday, I wanted to share a little bit of my girls with you. The art runs thick in their blood and thick in ours. It will forever be a part of our family, and for that I am eternally grateful! I know it's Saturday, but I'm going to post a Giddy Up Friday post anyway. 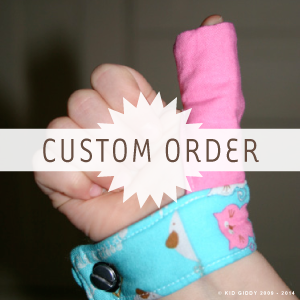 I've been traveling to visit family during my daughter's winter break this week, so I didn't have as much time as I hoped to blog, sew more thumb covers, and to write songs, etc. So much to do - so little time! Grab a few pieces of white paper and a white crayon. 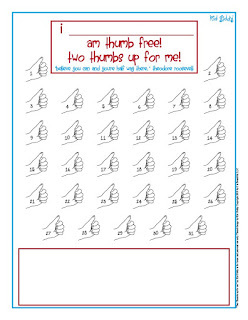 Draw a picture or write a message for your child. 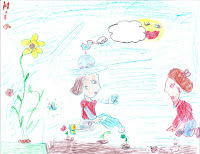 When your are done, give them some watercolors to paint, have them uncover the secret image or message. I love to do this for my daughter's with a huge surprise or just to tell them I love them. Images obviously work best for little kids. Last summer my sister (the more creative one with food)...cut, sliced and diced this schmorgesborg of fixings for kid size taco salads. 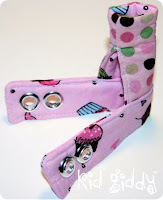 For some bizarre reason, I haven't made them since - but my girls LOVED it and so did I! Forgetful is most likely the reason, but you've got to try this...it really takes no time at all! Everything on my list is optional and of course add to this list anything else you might want to include in your mini taco salads! What can't you live without? Cut, slice, dice, mince how ever you prefer...leave them in separate bowls or make separate piles on a large serving plate. Give each child a certain number of tortilla "bowls" on their plate and allow them to make their own salads. With my own girls I put their protein in their bowl first, so they knew that had to be in there. Protein? They didn't care - they were just excited to make their salads and eat them too! This is another one of those...you can't just have 5 - so be aware of the portion control if you choose to make these - it's easy to keep popping these in your mouth! And folks...these aren't just for kids! These make a great party or dinner appetizer! Serve them up the next time you have company over! Thanks sis! Enjoy everyone! kg (pictures will be forthcoming). Many of my friends and family know that I'm not a huge fan of the winter snow. The cold bitter air flying up off the snow makes me itch. If it were always warm and melted quickly, I wouldn't mind so much. But there is still something mystical and magical about a first snowfall. The earth covered in white is a sight to behold. When my girls go out to play - I love taking their pictures and watching them grow out of their snow suits from year to year, and while they continue to play, I enjoy taking pictures. 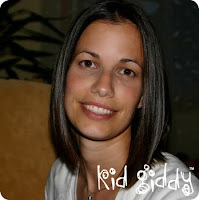 All photos on this blog are property of Kid Giddy a division of 2 is Beautiful, LLC (unless otherwise noted). Copyright 2010 All Rights reserved. Please do not copy without permission. 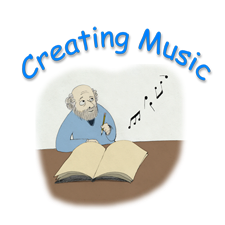 In the meantime...I found this really awesome website for teaching kids about music and learning how to play, and found some really great online games too! It starts here at Play Music.org - where you can choose from a variety of things to do (or learn more about). The best option - clearly is the Creating Music ("Try Writing Your Own Music"). Once you get to Creating Music - you can learn a whole host of things by playing different games. You can listen to the music and determine the pitch, or play with scales or simply - make your own music! The possibilities are endless! 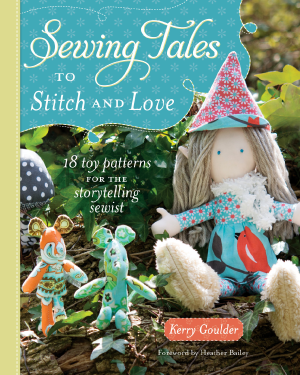 If you are homeschooling, or teaching your child how to do something you love to do as a hobby (or career), or if they have even expressed interest themselves in learning - this is a great resource! No matter the reason - check it out. It's even fun for adults too! Because this is "FAWM.org Music week"...I thought I would snag one of the "fawmers" (someone that write songs during February Album Writing Month) that I know, who not only loves music, but also LOVES to cook! I met Dan & his wife in my driveway last summer. It was too nice to be indoors so the kids were out at play during this drive-by first time encounter! I am now very sad to say - he didn't cook (or grill) for us...but I'm hoping the next time he rolls through my town and into my driveway - he will! "I like to cook for many of the same reasons that I like to write and perform music. I'm one of those people that gets really excited about food. I like the creative process of experimenting and perfecting recipes/techniques and I love to cook for other people. My mother is amazingly talented at cooking and baking! Between growing up with home cooked meals everyday, and being able to eat at unique restaurants around the country while traveling, I have an endless supply of inspiration." The ingredient list is below but for all the directions, watch this awesome pilot episode (no drooling): 'Funktified Food with Dan Vaillancourt'. Dan will begin filming more episodes in just a of couple weeks and cranking out new videos with lots of new recipes soon! If you have some feedback for this pilot episode, please leave a comment on his Funktified Food Facebook fan page. Dan will be implementing some of those suggestions/feedback for the upcoming shows. Stay tuned and follow along at www.funktifiedfood.com. Vegetarian Option: Replace chicken and bacon with grilled zucchini and pine nuts. If you'd like to learn more about Dan and his many musical talents....you can visit him online at DanVaillancourt.com. 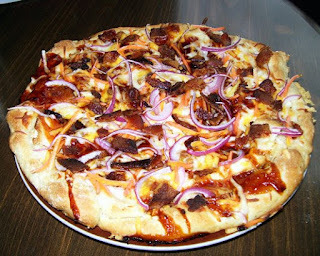 Thanks so much Dan for sharing your awesome pizza with us today on Kid Giddy! Now get out there people and make Dan proud! If you enjoyed this post - please leave a comment below and share the love! What is February Album Writing Month.......writing songs! also known as "FAWM". I found out about FAWM in Dec of 2006. I was talking with my friend Erin Maeflower - on the way home from Boston MA. I told her I've always wanted to write songs. I had started writing poetry when I was in college - My first poem was about the Sun and the Earth - it was more than I ever expected to write. I surprised myself and every year I continue to surprise myself. But I found I LOVED writing poems. Luckily, when Erin had told me about it, it was late Dec. It's just songwriting - learning how, and just doing it. "You should try it she said". I didn't have to wait too long to really know what it was all about and to give it a try, because it was only 2 months away at best. So I began my first FAWM.org challenge in February 2007. It was amazing to say the least. The community of fawmers was with me all the way. I had fawmers backing me up when I felt like I no place being there "writing songs" without a guitar or piano. I found myself feeling like a dork in the midst of these amazing indie artists! While on the forums I posted that I was hoping to collaborate with this awesome vocalist Becca Palm. She said she'd keep an eye on my lyrics - and if something caught her attention, she'd let me know. Collaborating wasn't all that common yet. Many songs later, I was plugging away at my 14 song goal (14 songs is a standard length album - so the goal is to write 14 songs in 28 days). Finally I wrote something that had substance - merit, I guess. And Becca agreed. She played around with it (without me knowing yet) - mixed up my chorus a little to make it flow better and worked her magic on the piano & vocally. The results made me cry and I knew I wanted to do this every year from then on. 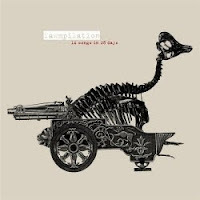 The song The Moon Escapes Tonight can now be found on the Volume 3 fawmpilation disc on itunes (or by clicking on the steampunk cover image). I continued to write song lyrics that summer every once in a while, and looked forward to my next FAWMexperience! Feb 2008, for my second year of FAWMing I wrote 18 songs and the collaborations were phenomenally awesome! 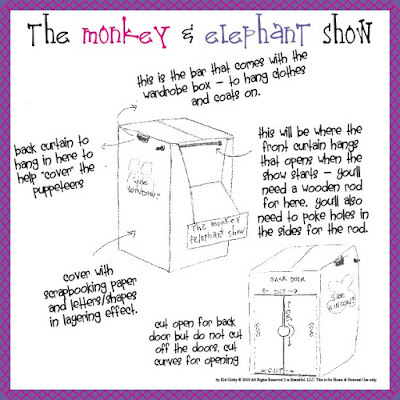 so was my song "I'm Toast" - with both of my daughters (Monkey & Elephant). Later in 2008 I attempted my first 50/90 (write 50 songs in 90 days) and collaborated with some amazing folks out there in FAWM & 50/90 world...and came away with 11 songs. 50/90 last year - was hit or miss for me. I was so busy and my girls are getting older so our summers mean outside fun and no songwriting. I did manage to write 5 songs one being the song "Our Yesterday" which was demo'd by 5 different artists! Now I come to FAWM 2010 with a full heart, a full plate in front of me with my Etsy shop and my Blogging and my Family...and church and my girls schools...cleaning my house...wow! I get tired thinking about it. So by the time you read this - I will have been fawming for one week. (Today it's only Jan 30th - I'm trying to get ahead of my posting so I can fawm too!) This whole week will be dedicated to my "FAWMmunity"! If you haven't noticed - we use a lot of "fawmisms". My first year writing I was a "fawmling". It's tons of fun. If you have ever wanted to write a song, or you want to hear some of the newest, most amazing up and coming indie artists - check out FAWM.ORG! I just wanted to throw this in here...I didn't get a chance to get a shop up here today to feature for Seller Saturday. I was busy taking care of my little girls - one is was getting better but developed an ear ache, possibly infection this evening (I can actually see that it's red in there...so sad & painful)...and the other one just started getting sick and is sitting on the fence - not sure she wants to get worse or better! On top of all that - I went to my church today because we were hosting a Project Linus - "Blanket Days"...and I really wanted to make a blanket, and use up some fabric and donate lots of fabric...and call myself a "Blanketeer"! So - that's what I did! I will post the picture Monday after I download it! Have a great weekend. Stay tuned for a musical week ahead! A couple of weeks ago my girls found the puppet bag. The puppet bag was filled with little finger puppets I used when they were little and stored away for a while as they seemingly moved on from them. When they saw the bag - they gasped and immediately began playing with them again. Mind you - my girls aren't teenagers. Monkey is almost 7 and Elephant is almost 5 1/2. So it's perfectly normal they would still want to play with them, it was really cute! Some things can bring back fond memories. So as I come back from my short birdwalk down memory lane....it got me thinking I never did make a puppet show box for them. Now is the time mommy! Follow the planning with me! Shorty Wardrobe Boxes from Uhaul are $7.95 and the Grand Waredrobe Box is 11.95. I don't recommend the space saver size they offer as it may be so skinny a child could tip over while in it...Now you can use a regular box - but how many of us get items from the store or shipped to us in a box this big? Let's be fun here - just once in a while! I have some of the coolest friends!!! And this friend asked her hubby if I could share this awesome recipe with you all - and guess what, he said "Yes"! 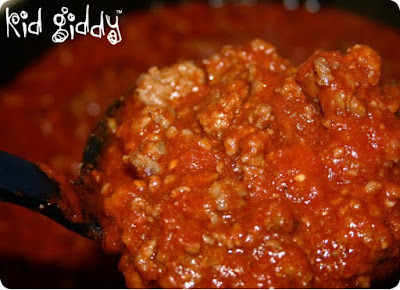 They only really referred to it as the Best Meat Sauce in the whole world...and I pretty much agree since I went to her house when it was being made and almost fell over when the aroma smacked me in the face! I just wasn't expecting to smell something that yummy without being in a restaurant. Wow - was I pleasantly surprised, and so was my tummy! So without further wait - I give you the "MacDaddy Meat Sauce" as I lovingly have named it....MacDaddy referring to the "person" and MacDaddy referring to the "status" of this being the best in the whole world! Brown the meat and the sausage. Mix all ingredients in a deep pot and simmer. The longer you cook it - the better it is! Do you have an awesome recipe you'd like to share? - Your recipe could be a future Edible Wednesday! Click the Contact Me button above and email it to me. Please include one photo (must be your photo) of said recipe completed - the Ingredients, Directions and the story behind it. Thanks! 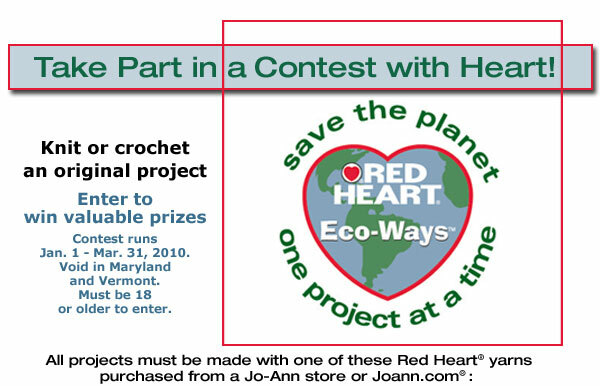 Hey everyone - in my search for something on Joann Fabrics - I came across this contest.